Some of our fellow Jews realize that repentance, prayer and charity are not enough to provide atonement on Yom Kippur. So, what do they do? Kaparos or Kaparot is the ritual ceremony and sacrifice of a chicken in order to provide for the atonement that would cover our sins. After all, the Torah calls for a Yom Kippur sacrifice. 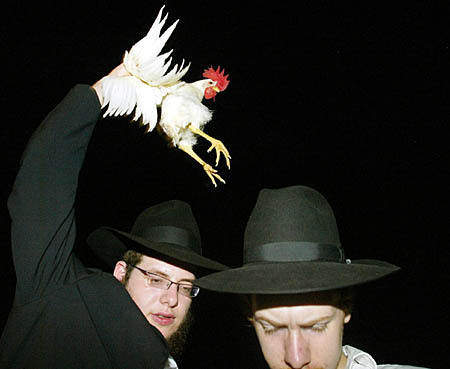 The officiating rabbi, Shokhet or yourself would swing the chicken over and around the person (which may be you!) three times to receive atonement while reciting traditional prayers. Afterward comes slicing the jugular of the chicken which almost completes the atoning process. Pay for the chicken and it’s all done! Before we deem this seemingly crude and cruel ritual ‘barbaric’ let’s consider the realization that some Jews still understand that the Torah requires a blood sacrifice during Yom Kippur. Well, I suppose sacrificing a bull and a goat (Lev. 16) might be a little much in the 21st century, so let’s cut them a break and pray that G-d will reveal Yeshua – the once and for all kapparah (atonement). I have been considering an interesting connection between Yeshua and the chicken from Matthew 23:37-39. Let me know what you think? Isn’t it time for all of us to say, “Baruch Haba B’Shem ADONAI,” and welcome Yeshua the Messiah, who laid down his life as our atonement, back to Jerusalem? Or, are you too chicken? For a schedule of our Yom Kippur services please click here. ← Why is this Holiday different from all other Holidays? Thank you for reflecting and illuminating the Truth, Rabbi. And thank you, Yeshua, for Your Redeeming Grace.